» The Forgotten Front Seven: Can Green Bay’s Defense Slow Down Seattle’s Rampant Run Game? The Forgotten Front Seven: Can Green Bay’s Defense Slow Down Seattle’s Rampant Run Game? It’s no surprise the NFC Championship Game has mostly been framed as a battle between the Green Bay offense and the Seattle defense. Both rank first in DVOA, the Packers are quarterbacked by the league’s likely MVP, and the Seahawks secondary has been the best unit in football — at any position — for about three years now. But let’s not forget about the other side of the ball. This year, Seattle’s running game has been as good as its defense. The Seahawks were first in rushing DVOA by a massive margin, averaged a ridiculous 5.3 yards per carry, and, thanks to Marshawn Lynch, also led the league in yards after contact per rush. We’re only a week removed from Russell Wilson shredding a pretty good Carolina pass defense, but based on what the Packers do poorly — read: stop the run1 — a steady diet of Lynch and option plays for Wilson is likely to be Seattle’s best offensive game plan. In order to stop Seattle’s two-headed rushing demon, Green Bay will be relying on a mix of unheralded veterans, midround draft picks, and some aging and out-of-position stars. Sure, that might sound bleak, but it’s the best group they’ve had in a while. Dating back to 2006, the Packers have spent six of their nine first-round picks on front-seven players — and the results have … well, they’ve been mixed. Defensive tackle Justin Harrell, Green Bay’s first-rounder from 2007, played just 14 games before injuries forced him out of the league. A.J. Hawk was a solid contributor for years but never quite reached the expectations that came with being a top-five pick out of Ohio State. It’s still too early to tell with Nick Perry (2012) and Datone Jones (2013), but both have been relatively disappointing. B.J. Raji’s case is a bit more complicated. After the Boston College product’s first two seasons, including his play during Green Bay’s Super Bowl run, it looked as if he were on his way to becoming a star. That never happened, though, and when Raji’s contract expired last offseason, he signed just a one-year deal to stick with the Packers. Despite only a short-term commitment, Raji was penciled in as Green Bay’s starting nose tackle, so when he tore his biceps and was lost for the season, it sent the Packers searching for options. They ended up settling on Letroy Guion, a seventh-year player out of Florida State who’d spent his entire career with Minnesota. The Packers had signed Guion to a one-year deal last March, probably with the thought he wouldn’t be more than a rotation player along the defensive line. Instead, Guion played the most snaps this year of any Packers interior lineman not named Mike Daniels. At 6-foot-4 and only 315 pounds, Guion is a bit lean for a nose tackle, and that often shows up in his inability to hold his ground. He’ll have his hands full with Max Unger on Sunday, even if the Seahawks center isn’t fully healthy. But while Guion hasn’t been a star, considering he didn’t even play for Green Bay during the preseason, he’s provided as much — if not more — than anyone could have expected. Speaking of expectations, Mike Daniels has bum-rushed the hell out of whatever his were. Now in his third year after being drafted out of Iowa in the fourth round, Daniels has turned into one of the more underappreciated players in the league. At this point, he brings as much to Green Bay’s defense as anyone, including Clay Matthews. He’s a force both as a pass-rusher and a run-stopper, and his effectiveness is pretty easy to explain: Mike Daniels is much, much stronger than you. Coming into the league, quickness was the main attribute scouts noticed in Daniels, who some considered too small to play defensive tackle at the next level. But he more than makes up for any lacking measurables with an ability to either drive offensive linemen back or toss them aside. This play against Ronald Leary from last week — and others like it — show up all the time when you watch Daniels on tape. At the snap, he sticks Leary two yards deep in the backfield, and as DeMarco Murray gets near the line of scrimmage, Daniels simply discards the Dallas guard and makes the tackle. His strength and good hands allow him to control blockers and maintain two gaps at once. Julius Peppers: Still Pretty Good! While Daniels had a typically solid day against Dallas, Julius Peppers showed up with the spectacular plays for Green Bay. With a strip-sack, a big tackle for loss, and the strip on Murray’s probable touchdown run, it may have been Peppers’s best day as a Packer. His stint in Green Bay didn’t get off to the best start. Peppers struggled against some of the option concepts the Seahawks trotted out in Week 1. It almost seemed like Seattle was using the Percy Harvin jet-sweep action to torment Peppers. Overall, though, there’s really no arguing with the results the Packers have gotten out of Peppers, who will turn 35 on Sunday. When he was at his best, for much of his time in Carolina and early on during his days in Chicago, Peppers was a dominant force both against the run and as a pass-rusher. His value against the run has waned in Green Bay, but he’s given the Packers their first reliable pass-rushing threat across from Matthews. Peppers has eaten opposing right tackles alive at points this season, and when the Seahawks do drop back to pass Sunday, it’s worth keeping an eye on how rookie Justin Britt handles him. Even with middling returns from some of their highly drafted linemen, the weakest spot on the Packers roster early in the season was inside linebacker. 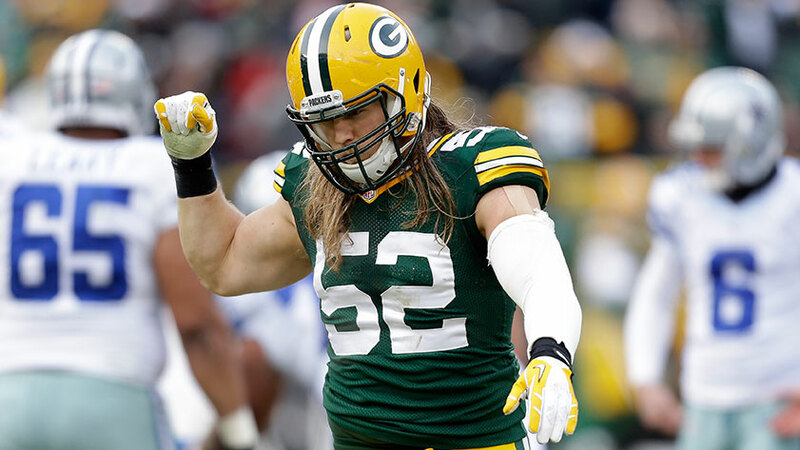 Yet with the amount of success Clay Matthews has had at outside linebacker, it was easy to understand why some people had doubts about the midseason decision to move him inside in certain situations. After all, Matthews was the Green Bay pass rush for most of the past few seasons. But with Peppers finally providing another steady pass-rushing presence on the outside, Matthews has played a significant amount of snaps inside, giving a big boost to the Green Bay run defense. Over the first nine weeks, before Matthews slid inside, the Packers allowed 4.8 yards per carry — 29th in the league. From Week 10 through the end of the season, that dropped to 3.6 — the sixth-best mark over that stretch. Matthews still plays his share of snaps outside, but with the flexibility to move him inside, the Packers have been able to limit the playing time of some of their lesser linebackers. Still, Green Bay may have improved down the stretch, but nowhere in those final eight games did it see a rushing offense like the one it’ll be up against Sunday. The combination of Lynch and Wilson is unlike anything that exists in today’s NFL, and it’s hard not to think of the Packers’ read-option issues from years past when considering how this one might go. But with their two best defensive players now operating on the inside, in addition to some celebrated and overlooked offseason acquisitions, the Packers are better positioned to slow down a great running game than they have been in quite some time. Green Bay finished 24th in rushing DVOA after ending up 30th a season ago.